When trees and grass occupy the same piece of land, they compete for moisture and nutrients in the soil. Because grass roots tend to be plentiful, trees may not flourish. This is especially true when trees are young and have not yet fully established their root systems. 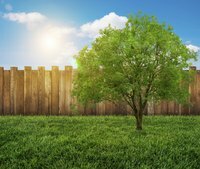 Killing the grass around a tree can be beneficial to the tree’s growth and health. Eliminating the competition helps your trees grow strong. Mow the grass beneath your tree as short as possible. This leaves less grass to eliminate, gets closer to roots, and limits the amount of energy available to grass roots. Wet the grass beneath the tree, and then cover the wet grass with eight to 10 sheets of newspaper. Wet between each newspaper layer to weigh them down and keep the wind from blowing them away. Cover the newspaper with mulch. The newspaper prevents light from reaching grass, so grass dies. The paper also decomposes, adding nutrients to the soil beneath the tree. Use black plastic as an alternative to newspaper. Like the newspaper, the plastic blocks out sunlight and smothers grass roots, killing existing grass and stopping new growth. Place large rocks around the edges of the plastic to hold it in place. The plastic can be removed after a few weeks, when grass is completely dead. Spray remaining grass around a tree with white vinegar. Try not to let the vinegar come into contact with nearby plants, as it may damage them as well. Guard against oversaturating the grass. If vinegar soaks into the soil, it can harm nearby plants. What Happens if Plants Are Planted Too Close Together?